Enroll in Perks for a chance to win! By enrolling or updating your Perks account by October 31, 2018, you could win your share of thousands of dollars in free groceries each week! The Grand Prize winners will receive a $100.00 shopping spree and an iPad. Week 1- You could win one of twenty $50 wallet credits. Week 2- You could win one of twenty $20 wallet credits. Week 3- You could win one of thirty $10 wallet credits. Week 4- You could win one of sixty $5 wallet credits. Week 5- You could be one of five grand prize winners receiving a $100 wallet credit and a new iPad. 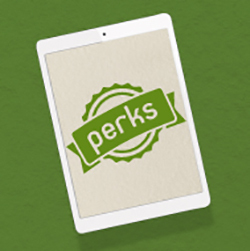 Click here to learn how to sign up or update your Perks account.